Makerspaces embrace emerging technology to foster innovation communitywide. On any given day, users of the makerspaces at the University of Wyoming include students of all ages, hobbyists, researchers and entrepreneurs. 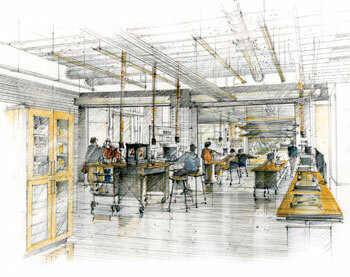 Simply defined, a makerspace is a collaborative workspace for making, learning and exploring. UW is home to several makerspaces, also known as innovation centers, including the main Coe Student Innovation Center (CSIC) in Coe Library, the ASU-IT 3D Print Center in the Information Technology Building, the 4D Visual Art Fabrication Studio in the Visual Arts Building, and the soon-to-open Student Innovation Center in the new Engineering Education and Research Building. The 2,500-square-foot CSIC makerspace is open to the community and provides a central hub for those interested in innovative projects. It houses 10 of the ever-popular 3D printers; a 3D scanner; a fablab featuring sewing machines, a vinyl cutter and a large-format poster plotter; an electronics bench; a virtual reality station; laptop stations with computer-aided design and modeling software; and K–12 stations, including littleBits, Lego, Lego Mindstorms and Ozobots. The more than 3,000 people who have used the CSIC in its first year include community members 3D printing antique car and bicycle parts; researchers 3D scanning fossils; K–12 groups tinkering; entrepreneurs creating prototypes; an entrepreneurship student group holding its monthly meetings; and college classes 3D printing musical instruments, petroleum engineering drill bits and molecules. Opening this fall, the Engineering Education and Research Building Student Innovation Center is an even larger space at 3,500 square feet, located in the new building north of Lewis Street between 11th and 12th streets. This new makerspace is intended to provide students, faculty and staff with access to state-of-the-art equipment, including industrial ceramic and metal 3D printers, 3D scanners, laser cutters, high-end computer numeric control machines, an electronics lab, virtual reality equipment, a wood shop and fabrication equipment. Next door to the makerspace, a reconfigurable student project room will feature ample space for UW campus community members to design and build large projects. To learn more about UW’s makerspaces, visit uwyo.edu/sic/makerspaces.